Craft workers, creatives and executives working in Louisiana’s film industry are starting to reconsider whether they have a future in the Bayou State. Louisiana rewards in-state film productions with tax credits, which can be sold on the open market or back to the state. But since state lawmakers capped the program last summer, the film business has declined about 80%, says Louisiana Economic Development Secretary Don Pierson. For Baton Rouge-based Active Entertainment, about 25% of a typical film’s budget depends on the state tax incentive program, says Daniel Lewis, the company’s chief operating officer. The company has secured loans with the assumption of being able to quickly monetize those credits. But now Active, which has made several made-for-TV movies for Lifetime and Syfy, might start shooting movies out of state or simply move elsewhere. Read the full cover story featured in the current Business Report issue. 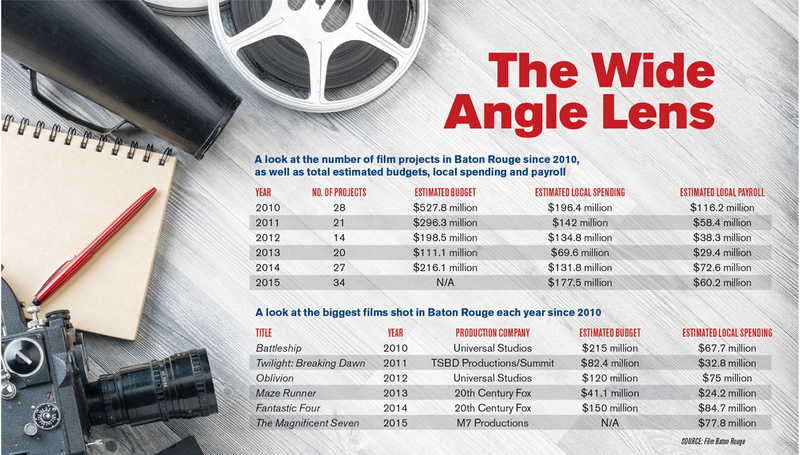 View graphics on number of film projects in Baton Rouge and take a look how Louisiana’ film incentive program compares to other cities. Send your comments to editors@businessreport.com. This entry was posted on July 6, 2016, 1:54 am and is filed under Louisiana, Tax Incentives. You can follow any responses to this entry through RSS 2.0. Both comments and pings are currently closed.